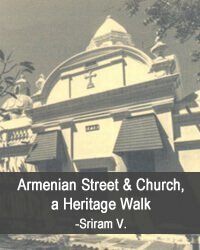 A guide book to enable you to take a heritage walk by yourself down Armenian Street, Chennai 600001. No of Pages: 16, covering 11 places of interest. Fort St George is the administrative seat of the Government of Tamil Nadu. It is also a historic precinct that dates back to 1640, a year after the British established a base in Madras/Chennai. It therefore holds within it 377 years of history. In the fort are to name a few must-see relics – the tallest flagstaff in the country, the only surviving Indian national flag among those unfurled across the country on August 15, 1947, the oldest Anglican church east of the Suez, the first British inscription in India and the largest covered barracks in the country. There are besides hundreds of stories of the people who lived, loved, broke up, stole, earned, profited and died within the walls. 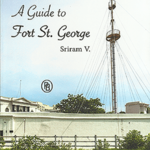 A Guide to Fort St George is a volume that enables you to take a tour by yourself of the Fort. Covering 30 buildings and provided with a map and several photographs, it is a boon companion for people wanting to make sense of the various structures inside the walls of the Fort. Compiled by historian Sriram V and published by Palaniappa Brothers, the book can be ordered here. All proceeds from the sale of the book go to Chennai Heritage, the not-for-profit company. 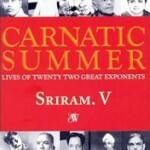 Carnatic Summer, the lives of twenty-two exponents. This book chronicles the lives of some of the greatest stars of the 20th century. Beginning with the man who gave us the modern concert format – Ariyakkudi T Ramanuja Iyengar, it makes it way up relatively younger musicians such as Mali Released by Justice Prabha Sridevan on 12th December 2004, the first copy was received by Sanjay Subrahmanyan the eminent Carnatic singer. APJ Abdul Kalam, who claimed to have read it in one night, described the book as ‘unputdownable’. Carnatic Summer was reprinted for the tenth time in 2013. Four Score and More, the History of the Music Academy, Madras c-authored with Dr Malathi Rangaswami, released by Dr C Rangarajan and with first copies being received by Sangita Kalanidhis RK Srikantan and R Vedavalli. 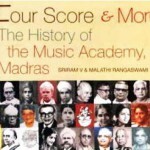 The Music Academy, the pioneering Sabha that first came up with Chennai’s celebrated Music Season, has had a colourful history of achievements, controversy and plenty of stirring events. All this and more, captured in a racy style, with rare photographs. 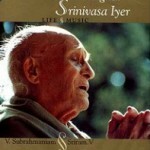 Semmangudi, Life and Music, co-authored with V Subrahmanyan and released on 25th July 2008 by the Hon. Dr APJ Abdul Kalam, is a biography of Semmangudi R Srinivasa Iyer, a top-ranking artiste, who dominated the world for Carnatic music for almost a century. 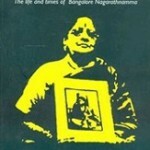 The Devadasi and The Saint, the life and times of Bangalore Nagarathnamma. Released on 19th December 2009 by Kanimozhi, MP with the first copy being received by Sanjay Subrahmanyan, this is the biography of a doughty woman who, from humble origins made it to the top. And while there, became a champion of Devadasi rights. And then she devoted her life to building a memorial to the composer Tyagaraja, at the spot where he was buried. This book won the United Nations Female Population Award for Gender Sensitivity in writing. 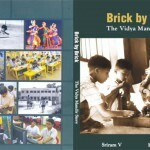 This book on Vidya Mandir Senior Secondary School, Mylapore has been penned by two of its alumni – Sriram V and Karthik A Bhatt. Released to coincide with the diamond jubilee of the founding of the school, it is an account of how the institution developed over the years and is today enjoys premier status in India with illustrious alumni all over the world, in several walks of life. Buy e version copy of the Vidya Mandir book. Put together by well-known writer and historian Sriram V, Past Forward specialises in heritage tours and trails. Each of these is crafted to suit a wide variety of interests – temples, stately homes, great personalities, scandals, music, dance, intrigues and plenty of humour. 2 & 3, Bhattad Towers,30 Westcott Road, Royapettah,Chennai- 600 014. Goodness & Mercy, the Life and Times of Dr Mathuram Santosham, released on 21st June 2013 by K Rosiah, Governor of Tamil Nadu. Dr Santosham was many things – a TB specialist, a philanthropist, a Congress man turned Swatantra Party member, an MP, a leader of the Christian community, an author and a man of music. 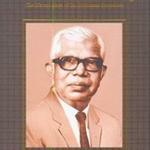 This colourful personality’s life is documented in this book. 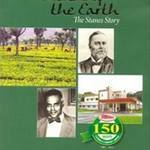 Friends of the Earth, the Stanes Story – a history of the 150-year old T Stanes & Co Limited of Coimbatore, released on 9th July 2012 by the Hon. Dr APJ Abdul Kalam. 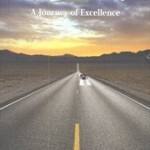 The Rane Story, a Journey in Excellence – released on December 9th, 2011 by B Muthuraman, Managing Director, Tata Steel. The Rane Group is one of India’s well know automotive component manufacturers. This is a chronicle of the company’s 75-year history. 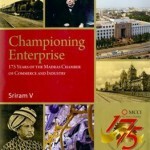 Championing Enterprise – the 175-year history of the Madras Chamber of Commerce and Industry, released on 29th September 2011 by K Rosiah, Governor of Tamil Nadu. The MCCI is the second oldest Chamber of Commerce in the country. It came up at a time when the empire was still in formation and Madras meant a vast Presidency, from Orissa to Cape Comorin. The Chamber was the pioneer in several infrastructural developments in the region, all of which we take for granted today – posts, roads, telegraph, the railways, the port and administration. Lavishly supported by photographs, the book looks at the way much of South India industrialised and urbanised. Fifty Historic Residences of Chennai. Released on 18th August 2008 by B Vijayaraghavan, IAS (Retd) and first copy received by S Muthiah, Chronicler of the City. 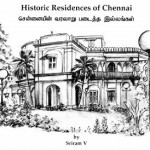 This book, a bilingual in Tamil and English, takes a look at what made a few houses in the city of Madras historic – their residents, stirring events that took place in them and reasons that they deserve to be commemorated. This book was brought out by Kalamkriya of the Sanmar Group. yourself down Armenian Street, Chennai 600001. No of Pages: 16, covering 11 places of interest.